If your PC's been humming along under your desk for more than a year or two, I've got news for you: Chances are inside that case, half a dozen dust bunnies are dancing around your hard drive, leeching onto your CPU fan and fluttering about your motherboard having a grand old time. This is not good. Today we'll go over how to clean out the guts of your computer, tighten, tune and oil things up to make your PC happier, healthier, and more likely to stick around longer. Note: Your best bet is to do this type of cleaning next time you're inside your PC's case, like during a new RAM or hard drive installation. If it's simply been years since you've looked inside your computer - especially if you're a pet owner or smoker, or if your computer's fan's gotten noisier over time - it might be worth the dust bunny evacuation now, upgrade or not. Photo by Roger. Last time I had my case cracked open, I followed along with a great guide from PC Stats.Here's the basics. Mechanical oil with a dropper. I used 3-in-1. PC Stats does not recommend WD-40. A can of compressed air. Pick one of these suckers up at any computer supplies or electronics store, like RadioShack. First, prepare the computer for cleaning. Before anything else, back up all your data. (Better safe than sorry.) 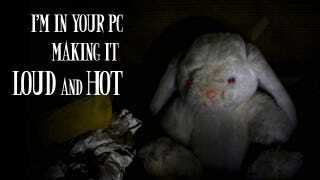 Then disconnect the power cord, monitor, keyboard, mouse and any other peripherals. Take the tower to a well-lit place outdoors on a porch or to the garage, or maybe to the basement. Do not skip this step because the compressed air is going to blow up a cloud of dust and chemicals you don't want in your home office or in your eyes or nostrils any more than absolutely necessary. Open up the case. My Dell goes on its side and when you push the release on the top and bottom, it slides open like a Delorian. Your case may (most likely will) vary. Consult your computer's manual for how to get yours open. Next, create a dust storm. Use the can of compressed air with the thin narrow straw attached to the nozzle to blow the dust off all the components inside your PC's case. Keep the can upright as much as possible to avoid liquid coming out of the can, but if it does, it shouldn't harm the computer's innards. Don't do this near kids or pets, and know that as you use the can, it will get cold in your hand. Be sure to get into all the cracks and crevices, and do dust the grill on the back of the machine as well. PC Stats says that compressed air should not be used to clean fan blades because it will make them turn faster than they were meant to and this could cause harm. The fan is plastic anyway and can be cleaned with a damp cloth, which we'll do next. There are two main fans in your computer: one inside the power supply and one over the processor. (Your computer may have more, but most computer have at least these two.) The power supply fan on my machine was sealed tight and inaccessible; so I cleaned it as much as possible from the outside grill. We care about the fan over the computer processor. Airborne dust, pet hair, smoke and particles can build up over time and slowly break this fan down and eventually overheat your computer. Some cleaning and a drop of oil can prevent this type of catastrophe, or at least put it off. 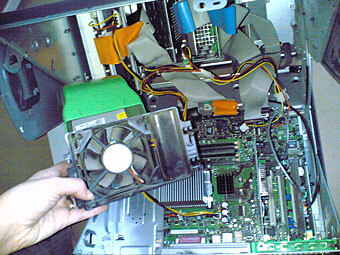 In my particular Dell (a Dimension series), the processor fan is covered by a green hood that flips up and snaps off. Using the screwdriver, dismount the fan from the inside of the machine without disconnecting the cords. Wipe down the plastic blades and casing with a damp cloth. I'm not a smoker or a pet owner but you can see my fan was blackened with dust. Finally, lube the fan mechanism. Pull up the sticker on the fan. PC Stats says some computers may have a rubber plug over the bearing inside; my computer did not. If yours does, pull up the plug with a fingernail or screwdriver. Then place one single drop of oil over the axle part which turns the fan. Then replace the sticker and remount the fan, hood and any nearby parts you had to remove to get to it. Before you close up your case, make sure all the connections inside your PC are tight and that no wires are hanging loose or pulled too tight. Firmly tighten any screws mounting PCI cards or drives and close up the case. Return the PC to its home location, reconnect all peripherals and boot up. If possible, place the machine on your desk instead of on the floor to reduce dust exposure. After the cleaning, your lubed-up, clean PC should run quieter with a much reduced chance of a hostile dust bunny takeover - that is, until the cat starts rubbing up against it. Gina Trapani, the editor of Lifehacker, wishes all computers and humans dust-free workspaces. Her semi-weekly feature, Geek to Live, appears every Wednesday and Friday on Lifehacker. Subscribe to the Geek to Live feed to get new installments in your newsreader.